In a previous article (AJAX – What’s the Buzz Part 1), we discussed the introduction to AJAX as a Design Pattern. We saw a simple demonstration leading up to why we might need something like AJAX ‘mechanisms’ and how these can be implemented. The article was basically a report from the session and workshop we had last week at AMIS. In this article, I will continue with the report, telling you about the discussion and brainstom we had, as well as the more advanced examples of AJAX usage. // the callback function that is called upon any change in the state of the xmlHttp object. // Note: these state changes occur at various times during the Http request/response cycle. We will most definitely not embark on a broad discussion on DHTML or even the DOM, but we will take a look at a simple example of using DHTML or displaying the Ajax response to the user. We have the same page as before, with the humongous button. This time we will not be so crude as to display the Ajax response in an Alert. We will be sophisticated and use DHTML to show the response dynamically in our document. (note: you can click on the image for a live demo). Note that we have been somewhat lazy by just using the innerHtml property (once an IE only pollution of DHTML). There are more refined ways to programmatically create DOM elements, as we will see shortly. The next example shows an amalgation of two samples from the book Foundations of Ajax (see Resources). 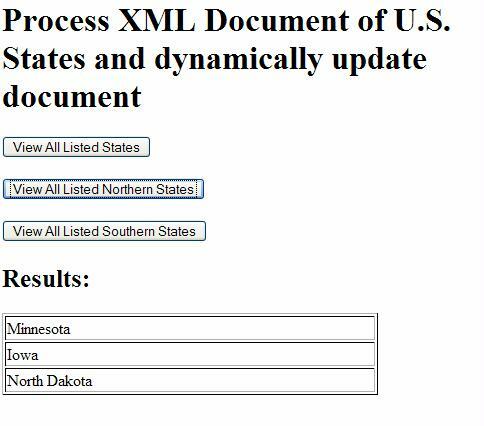 It illustrates a combination of an Ajax request to retrieve data depending on a selection made by the user with dynamically creating DOM nodes to display a table with these values. For a live demo of this example, see here: http://www.amis.nl//files/technology/ajaxBuzz/DHTMLCreatingNodes/parseXMLandDHTML.html. Discussion: what do we use Ajax for and what are the challenges it brings? Having seen some examples of famous Ajax applications (see the first installment Ajax What’s the Buzz) and now having taken an more in depth look at what you can do and how you can do it, we discuss the potential for Ajax in our own applications. We typically develop data oriented OLTP style administrative web applications using Java/J2EE technology. How does Ajax fit in with that type of application? Prototyping and Functional (interaction) Design – static HTML and frequent full page refresh will not do at all! Complexity of the application – for development & maintenance and for the end user! 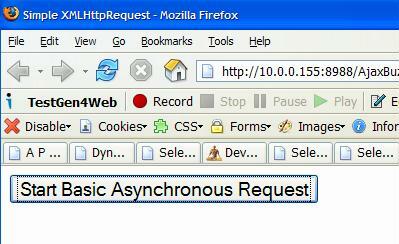 Back Button – what does it mean to push the Browser’s back button in a Single Page Application? Danger of going completely overboard with Ajax: it can be done, so we will do it! So far, we have had very simple Ajax applications with only one Ajax request at the time. Or at least that was our assumption. 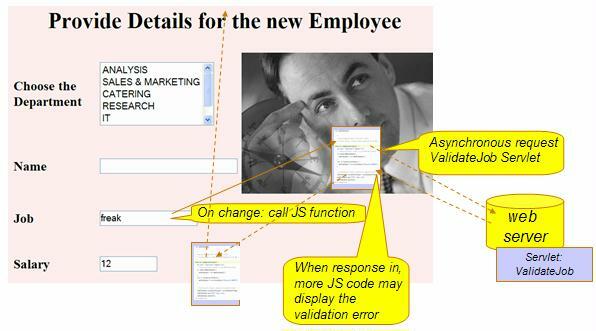 In the validation example we saw before, if we had added a server side validation cycle for the Salary field and we had a quick typist, we might have run into problems: after leaving the changed Job field, an Ajax request would be sent, using the global xmlHttp variable. Then, if the user would change and leave the salary field before the response to this request was in, we would reuse this variable to fire another Ajax request, this time to validate the Salary. 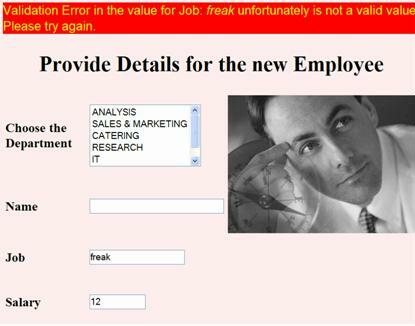 We would have lost our hold on the original Job validation request and would not be able to present a warning to end user if that validation failed. Here we create a callback function on the fly. This function will make a call to the function onReadyState of the ContentLoader (prototype) object that in turns makes a call to the function specified in the onload property of the current ContentLoader object. In both calls, the ContentLoader object is passed as a parameter. Hence, each callback function has access to its own and private request object! In this example, we do three simultaneous Ajax requests, each with their own callback function, each request neatly encapsulated in its own ContentLoader object. I have taken the ContentLoader library we have introduced before and modified it to suit my current needs. I have extended the ContentLoader object, to also contain a property refreshInterval. When set, the request associated with the ContentLoaded object will be scheduled to be re-executed when it has completed. This functionality is found in the last lines of function startProcessing(). Note by the way that this function has some default processing capabilities: if no callback function is specified and if an element is assigned to the ContentLoader, then the Ajax response is pasted either into the value property if that exists (for HTML Form elements like INPUT and TEXTAREA), otherwise the response is pasted into the innerHTML property of the specified element. This modified version of ContentLoader can deal with Cross Domain requests (see next section) that require a proxy to handle the request from the server side. See the function postLoadSingleResource() for details. // and the requested content is available for further processing. , "Get AMIS Blog Total Postreads"
Note: the above script gives problems in IE – though it should not. If I first load the page, it runs okay. When I refresh, it complains about objects to not having been defined. If I empty the browser cache, refresh the page and run again, it is fine again, until the next time I refresh. 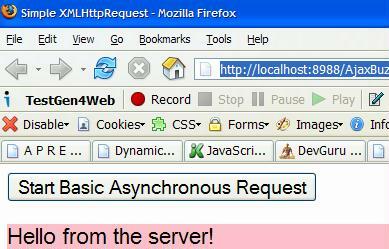 For Firefox is it running as it should – though not cross browser unless I use the proxy. Browsers try to be quite serious about security. One of the rules most browsers enforce is that a document loaded in the browser cannot make Ajax requests to any other website (domain) than the one the document was loaded from. So if our document loads from our web server, we cannot make an Ajax request to an RSS feed or Web Service just anywhere on the internet. That can be a pity – even though this security thing is of course for our own good. For the purpose of this workshop, we took the easy way and just used Internet Explorer and the work around described below. Therefore, we did not need a proxy servlet to make the remote calls for us. We also discussed the upcoming changes in JSF 1.2 that hopefully will make integration of Ajax concepts with JSF somewhat easier (possibly allow a subset of components in a view tree to render their response and possible allow for a special non-visual render mode in which components render some sort of structured response (XML? ), geared towards contents and not layout/markup). Any ideas of how I can pass an elementID to this function??? Nice blog entry to hack the site.